Nancy Skinner (born August 12, 1954) is an American politician and a member of the California State Senate. 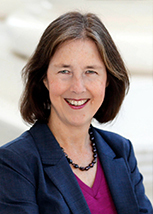 A Democrat, she represents the 9th Senate District, encompassing the East Bay. Prior to her election to the State Senate in 2016, Skinner was a member of the California State Assembly representing the 15th Assembly District from 2008 to 2014. She also served as a member of the East Bay Regional Park Board, representing Ward 1 from 2006 to 2008. Skinner was a member of the Berkeley City Council from 1984 to 1992; she remains the only student ever elected to the Berkeley City Council. She had previously founded and worked for several non-profit groups on global warming and other issues related to environmental policy. Skinner attended the University of California, Berkeley, and earned both a B.S. from the College of Natural Resources and a Masters in Education from the UC Berkeley School of Education. As a student, she was a leader in the Anti-Apartheid Movement, served as the Academic Affairs Vice President of the ASUC, the student government, and was a founder of ASGE, the Union of Graduate Student Employees. Skinner later taught courses in native California plants and interned at the Golden Gate National Recreation Area. Skinner was elected to the Berkeley City Council while still a student and served from 1984–1992. She remains the only student ever elected to the City Council. During her time on the council, she helped establish Eastshore State Park, pushed for Berkeley to become the first city in the United States to have a 50% recycling goal, and authored legislation to ban Styrofoam at fast food businesses, the first such legislation in the United States. After serving on the City Council, Skinner served in leadership capacities for several non-profit organizations concerning the environment. She co-founded ICLEI-Local Governments for Sustainability, a coalition of 800 global cities, and Cities for Climate Protection with 500 U.S. member cities, to assist urban regions with environmental and global warming policy, respectively. She was the U.S. director of The Climate Group, an international organization that works with businesses to address global warming. She also coauthored the best selling book series, Fifty Things You Can Do to Save the Earth and has written a pair of articles concerning global warming for the San Francisco Chronicle. Skinner was an active member in the PTA and worked on a campaign to pass a parcel tax to fund Berkeley schools. She was Chair of the Berkeley School Enrichment Program Committee at Martin Luther King Jr. High School. Skinner coordinated Loni Hancock's 2002 State Assembly campaign and was a Field Manager for Barbara Lee's 2002 Congressional campaign. She has worked for the campaigns of several local, state, and national democratic candidates, including presidential candidates Al Gore and John Kerry. Skinner was appointed to the East Bay Regional Park Board of Directors in March 2006 to fill a vacancy caused by the death of incumbent Jean Siri. She was appointed by a 6–0 vote and was selected over several other candidates for the position, including former Berkeley mayor Shirley Dean. Skinner was then elected to the East Bay Regional Park Board in 2006 with 84% of the vote. Her park district included parts of Albany, Berkeley, El Cerrito, El Sobrante, Emeryville, Kensington, Richmond, San Pablo, Pinole & Oakland. Skinner was considered a likely candidate for the California state Assembly as early as 2006 and had previously considered a run in 2002. She ultimately announced her candidacy in late January 2008. She defeated several opponents in the primary election; the most well-known of which included Richmond City Councilman Tony Thurmond, Berkeley City Councilman Kriss Worthington, and Berkeley resident Dr. Phil Polakoff. She was elected to the State Assembly in 2008 and re-elected in 2010 and 2012. In 2016, Skinner ran for the California state Senate to replace Senator Loni Hancock, who was termed out office in 2016. Skinner won the June 2016 Primary Election by over 17%. The General Election for Senate District 9 took place on November 8, 2016. Skinner defeated Assemblyman Sandré Swanson and was elected to represent state Senate District 9. She was sworn into office on December 5, 2016. In the 2017–2018 and 2019–2020 legislative sessions, she served as the Majority Whip of the state Senate. In the 2019 legislative session, she chaired the state Senate's Public Safety committee. Income Taxes on the Super Rich – AB 1130: Skinner pushed for legislation in 2011 that restored income tax rates on millionaires to the rate they were under Republican Governors Reagan and Wilson. The California Federation of Teachers fought for these tax rates to be in Prop 30, which increased Prop 30 revenue by over $2 Billion a year. Hungry Free Kids Act –AB 402: In 2011 Skinner passed a bill updating the CalFresh program. Children in the program live in households struggling to make ends meet. CalFresh can help struggling families have access to daily nutritious meals, yet thousands were not enrolled, the bill makes it easy for these families to be enrolled and receive the food assistance they need. College Student Access to CalFresh – AB 1930: Skinner carried AB 1930 in 2014 to give college students who were previously not considered eligible to CalFresh programs better access to food assistance. Internet Fairness – AB 155: Skinner pushed legislation to tax online sales that was approved in 2009 as part of the state budget. Gov. Arnold Schwarzenegger vetoed the legislation. On 19 January 2011 Skinner introduced similar legislation in the form of AB153. The bill requires out-of-state online sellers with affiliates in California to collect sales tax on purchases made by state residents. The affiliate provision was included to ensure that only sellers with a California nexus are taxed, as required by federal law. "This legislation will close the current loophole in tax law which has allowed out-of-state companies to avoid collecting California sales and use tax," stated Skinner. Skinner estimated that AB153 could produce between $250 million and $500 million per year in new revenue. She and other supporters of the bill believe that the election of Jerry Brown to the governorship and support from retailers such as Barnes & Noble will help the measure become law. Enforcing Workplace Safety – AB 1634: Skinner highlighted the dangerous conditions cited by California's workplace safety regulator that had to be fixed immediately, even if the employer appeals, so workers and communities aren't put at risk, passing AB 1634 to enforce workplace safety. Childcare and PreSchool Expansion – 2014 Budget Bill: As Budget Chair Skinner facilitated the largest funding increase for early childhood education in over a decade, enabling the State to enroll thousands more children in preschool and quality childcare. Higher Ed Funding While Halting Tuition Increases – 2014 Budget Bill: The UC/CSU systems suffered huge recession cuts resulting in student tuition and fee increases. As Budget Chair Skinner worked for a larger state allocation to UC and CSU with language that would rescind the funds if UC/CSU increased student tuition. Saving Energy Saving Schools – AB/SB 39: Schools spend millions each year on energy, Skinner's legislation, AB/SB 39, provided every California school district Prop 39 funds to pay for energy upgrades, enabling the money saved on utility bills to go back into the classroom. Foster Youth Detention – AB 2607: In 2014 Skinner called attention to the fact that foster kids get stuck in detention longer just for the 'crime' of not having a home, she wrote AB 2607 to stop the practice of using juvenile hall as a substitute for finding kids real homes. Juvenile Justice – AB 999: Skinner wrote AB 999, which was included in the 2014 Budget Bill, in 2009 to fix the unfair system used to incarcerate youth. Guards in state juvenile facilities used 'time-adds' to unfairly prolong the time youth were incarcerated. Within three years of stopping 'time adds' the number of youth in state incarceration was cut in half. Recidivism Reinvestment Fund – 2014 Budget Bill: As part of the 2014 budget bill Skinner saw that $100M was provided for community services to support reentry of our formerly incarcerated, required inmates be issued State IDs and be enrolled in MediCal prior to being released, and eliminated the lifelong ban imposed on those sentenced for non-violent drug crimes from ever accessing CalFresh or CalWorks. Doubling Rooftop Solar – AB 560: Written by Skinner in 2009, AB 560 expanded net metering so that homes and businesses could get credit on their utility bills for the electricity produced by their rooftop solar. Electricity from Renewable Energy – SB X1-2: Skinner's SB X1-2 bill set a 33% Renewable Portfolio Standard (RPS) requiring 33% of California's electricity to be generated from solar, wind, geothermal and other renewable energy by 2020. Energy Storage – AB 2514: Energy storage captures extra electricity produced by wind, solar and other renewable energy. Skinner's bill, AB 2514, makes sure utilities use energy storage electricity when we need it. Naming Eastshore State Park after Save the Bay Founder – AC 55: California's 8.5 mile ribbon of parkland along the eastern side of the SF Bay is now named after Save the Bay co-founder Sylvia McLaughlin due to Skinner, a worthy recognition of her significant leadership. Gun Violence Restraining Orders – AB 1014: Skinner saw that many instances of gun violence were preventable if the family was allowed to act when they saw one of their own show violent tendencies, as was the case with the Isla Vista Shooter. Her bill established a firearm restraining order so every family now has a tool to get guns out of the hands of those threatening violence. Assault Weapons Loophole – AB 48: California's assault weapons ban had loophole, it was perfectly legal to buy kits that converted guns into working like assault weapons. Skinner introduced AB 48, which made these ammo kits illegal. Transit-Rich Housing/Local Zoning Preemption – SB 827: In 2018, Skinner co-sponsored a sweeping bill to address the state's acute housing shortage by overriding local zoning laws to permit denser housing near mass transit and bus stops statewide. The bill failed to advance out of its first committee review. ^ a b c d e f "Skinner for Assembly Biography". Nancy Skinner for Assembly. April 2008. Retrieved 2008-04-02. ^ Nancy Skinner (2006-10-31). "Full Biography for Nancy Skinner". Smart Voter. Retrieved 2008-04-06. ^ David Scharfenberg (2002-10-10). "Student seeks City Council seat". The Berkeley Daily Planet. Retrieved 2008-04-06. ^ Richard Brenneman (March 2006). "Parks Board Picks Nancy Skinner To Fill Vacancy Caused by Death". The Berkeley Daily Planet. Retrieved 2008-04-06. ^ Scher, Judith (December 22, 2006). "Hancock to Vie for Senate Seat". The Berkeley Daily Planet. ^ Scher, Judith (September 21, 2001). "Loni Hancock to run for assembly – maybe". The Berkeley Daily Planet. Retrieved 2008-04-06. ^ Scher, Judith (January 29, 2008). "Skinner Joins Crowded East Bay Assembly Race". The Berkeley Daily Planet. ^ Brekke, Dan (June 8, 2016). "2016 Primary Roundup: Key Bay Area Races for State Senate and Assembly". KQED News. Retrieved 2017-12-16. ^ de León, Kevin (2016-12-21). "California Senate Leader de León Announces Committee Assignments for the 2017-2018 Regular Session". Retrieved 2019-02-20. ^ a b Atkins, Toni G. (2018-12-21). "Senate Leader Atkins Announces Committee Assignments for the 2019-2020 Legislative Session". Retrieved 2019-02-20. ^ "Bill Text - AB-1130 Income taxes: tax rates". leginfo.legislature.ca.gov. Retrieved 2017-12-16. ^ "Bill Text - AB-402 CalFresh program: School Lunch Program: information". leginfo.legislature.ca.gov. Retrieved 2017-12-16. ^ "Bill Text - AB-1634 Occupational safety and health: violations". leginfo.legislature.ca.gov. Retrieved 2017-12-16. ^ "Bill Text - SB-852 Budget Act of 2014". leginfo.legislature.ca.gov. Retrieved 2017-12-16. ^ "Bill Text - AB-39 Medi-Cal: designated public hospitals". leginfo.legislature.ca.gov. Retrieved 2017-12-16. ^ "Bill Text - AB-999 Juveniles: Division of Juvenile Facilities". leginfo.legislature.ca.gov. Retrieved 2017-12-16. ^ "Bill Text - AB-560 Net energy metering". leginfo.legislature.ca.gov. Retrieved 2017-12-16. ^ "Senate Bill X1-2" (PDF). ^ "Bill Text - AB-2514 Energy storage systems". leginfo.legislature.ca.gov. Retrieved 2017-12-16. ^ "Eastshore State Park Renamed for Environmental Champion". Oakland Post. October 5, 2012. Archived from the original on August 15, 2016. ^ "Bill Text - AB-1014 Gun violence restraining orders". leginfo.legislature.ca.gov. Retrieved 2017-12-16. ^ "Bill Text - AB-48 Firearms: large-capacity magazines". leginfo.legislature.ca.gov. Retrieved 2017-12-16. ^ "Bill Text - SB-827 Planning and zoning: transit-rich housing bonus". leginfo.legislature.ca.gov. Retrieved 2018-09-11. ^ Service, Keith Burbank and Daniel Montes Bay City News. "SB 827 fails in committee". San Mateo Daily Journal. Retrieved 2018-09-11. ^ "The NIMBYs Win This Round". CityLab. Retrieved 2018-09-11.